In the 21st Century the British Woolworths decided to reposition the brand after emerging from the Kingfisher Group. A new CEO sought to target young families, in a strategy that he dubbed 'Kids and Celebrations'. This brought a major extension of the toys range, which was moved to the front of the store and given extra space. When appointed in 2002, Trevor Bish-Jones took the helm a company that was already the UK market leader, even though it allocated only ten percent of its selling space to the range. By the time he left the space had doubled, and toys also featured in a big book catalogue. Yet the market leader was arch-rival Argos. It all goes to prove that sometimes more is less, particularly when the chain collapsed under the debts that had accumulated sice the demerger. Following Woolworths' demerger from Kingfisher, new CEO Trevor Bish-Jones launched a radical new strategy to transform the brand. 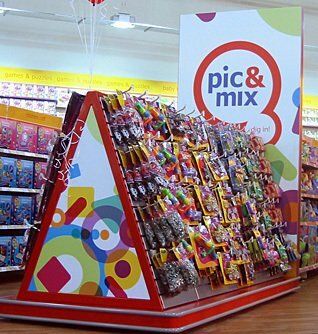 Described as a 'Kids and Celebrations' strategy this saw a new look for the larger stores in cities and market towns, which targeted mums and young children, introducing extended ranges of toys and promoting them towards the front of the store. The range of own brand Chad Valley Toys was developed and enhanced, with the Company enjoying particular success with 'Action Squad' - a range of toy soldiers - alongside an extensive range of pre-school toys extending the fun learning theme. The concept was extended further in the Company's new look out of town stores, with the former 'Big W' format amended and updated in Norwich and Tamworth and dedicating over a third of the total floor space to Toys and Children's clothes, highlighted by huge banners in the corners of the store. The displays included both bold displays of own-brand Chad Valley products and a range of supplier-branded toys to rival the market-leading Toys'R'Us out-of-town format. In homage to Woolworths' value roots as the threepenny and sixpenny stores, and their legendary weigh-out confectionery, the out-of-town stores incorporated new fixtures crammed with pocket money toys branded as 'pic & mix'. The fixture was given pride of place in the main gangway at Norwich and Tamworth, and proved a big hit with shoppers when the stores opened in 2003. 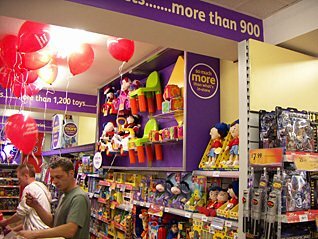 The addition of an in-store ordering system (ISO) in 2005 allowed the company to make some of the larger toys sold out-of-town available to shoppers in the smaller High Street branches. Toys featured extensively in the Big Red Book and the website presence. A short-lived format for the small stores installed showcases above the main toy displays. These were used to display a selection of items from the extended range that was available to order. They were filled with items like bicycles which were too large and impractical to sell in-store, offering customers the option of collecting their purchases in the High Street on their next visit, or taking advantage of convenient home delivery. A reappraisal of the firm's strategy inspired a new budget range, called 'WorthIt!' in 2007. This covered a gap in the offer which had opened the door to discounters. The WorthIt! toys were a hit, offering simple fun at pocket money prices. 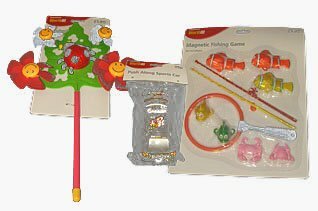 A magnetic fishing fame and brightly-coloured plastic windmills were particularly popular. Sadly the WorthIt! range came too late to save the stores, which fell into Administration in November 2008.